Well that is quite a mouthful, when compared to 'halogen downlights'. With halogen downlights being so popular in Australia, we thought it a good idea to introduce some of you, to the new LED LIGHTING. This form of technology is now able to replace most lights, in the Aussie home. What we will quickly discuss here, is the LED light as a form of halogen replacement. Yes they can but not with a standard incandescent dimmer. You will need an electronic dimmer. There are at least three ways a dimmer can be installed, into an LED downlighting system. Similar to an incandescent system, where there is a wall fitted dimmer control. Where the dimmer control is remote activated and sited in the roof cavity. The LED light comes with the dimmer built into the globe and is remotely controlled. Dimmers can be wired to dim a single LED downlight, or a large array. Do LEDs Come In More Than One Colour? Firstly we will cover the shades of white that a LED can come in. Unlike incandescent light globes, that were always warm white, the LED can come in warm or cool white, or just white. In fact LEDs can come in any colour. A new exciting feature of LED lighting is, colour changing. Illustrated above is a 3 watt MR16 12 volt halogen replacement. Whilst only 3 watts, it would not be the best choice to read under, but can be used to change the mood of any room. 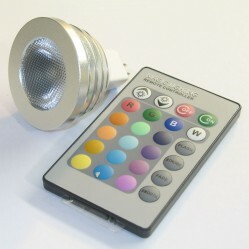 The remote control, offering colour changing sequences, fixed colours and dimming. Can I Just Install The LED Halogen Replacements? Some transformers may damage the LED halogen replacement. You may need to install specifically designed LED light transformers. Your old transformer is designed to trigger under high wattage. LED's are low wattage. The LEDs will not dim with existing incandescent or halogen dimmers. It is important to be aware of the above, as damage to the new LED lighting could occur. We would suggest you speak to your local light shop about your existing installation, regarding the suitability of transformers and dimmers. For more information on our LED downlight investigation, see our LED DOWNLIGHT COMPARISON TESTS. We will be reporting on other forms of LED lighting for Aussie homes soon. Subscribe to the Aussie Home Energy blog, to stay informed. Wow.. really a great thing. Amazing post!! This is great information for the all, who want to information related to Downlight Covers.thanks for share. I've learned a lot of information with this. It is important to know the safety measures of installing Downlights. And because of this post, people will know the problems that might occur and the things that you need to do.